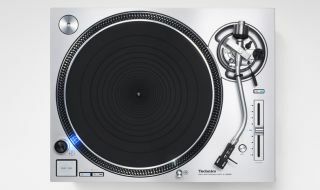 Technics unveils new SL-1200GR turntable, stereo amp and speakers | What Hi-Fi? The revitalised Technics brand today announced an expansion of its stereo range, with the latest incarnation of its legendary SL-1200 turntable, a pair of floorstanding speakers and a new amplifier. This time last year, Technics set vinyl enthusiasts around the world salivating with the launch of the SL-1200G direct-drive turntable. And today, at its press conference at CES 2017, the company has announced the SL-1200GR. This new turntable inherits many of the technological highlights of the SL-1200G, but not the eye-watering price-tag. The new SL-1200GR is expected to cost around $2000 (£1500). Of course, the new Grand Class SU-G700 stereo amplifier is equipped with a phono stage so it can be paired with the SL-1200GR. In addition, this 70 watts-per-channel (at 8 ohms) design features two analogue, two digital optical and two digital coaxial inputs – so it’s ready to deal with any source component you can throw at it. The integrated DAC is able to handle digital information up to 32bit/384kHz and DSD up to 11.2MHz. The amplifier follows the recent traditional of Technics amps inasmuch as it’s a hefty steel-plate construction with two visually arresting VU meters providing some pizzazz, and naturally enough it has some important-sounding acronyms attached to its specification. JENO (Jitter Elimination and Noise-shaping Optimisation) is an element of its full digital power amplification, designed to eliminate jitter throughout the entire audible frequency range, while LAPC (Load Adaptive Phase Calibration) is intended to eradicate the effect speaker impedance changes can have on digital amplification. At the front end of this range stand the Grand Class SB-G90 loudspeakers. Featuring disproportionately strong cabinets – thanks to separate sub-baffles for each of the three driver-mounting points, which also reduces unwanted vibration from the drivers themselves – the SB-G90s are fitted with a pair of 16cm aluminium-diaphragm woofers below a 25mm aluminium tweeter in the throat of a mid-range driver. This array gives a frequency response of 27Hz to 100kHz.